As heavy rain decimated the north east and threatened to ruin the chances of any cricket, a huge team effort from groundstaff and players ensured Percy Main’s game against early season pace setters Lanchester went ahead. 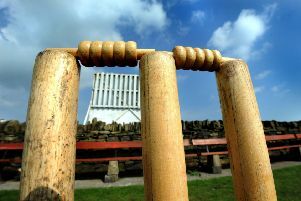 After a delayed start, which meant the game was reduced to 30 overs a side, skipper Barry Stewart lost the toss and was immediately inserted into bat on a green and damp wicket. However, despite the conditions Main made a good start with Anderson making a quick 22 and Stewart 15. Yet again, Australian Mitch Reid looked assured for a run a ball 40, but once he was out, a middle order collapse, bar resistance from Andrew Green, saw the home side dismissed for 118 with Halliday taking 7-31. Chasing a low target can often cause problems. However, having chased down 270 two weeks prior, Lanchester were confident. But Percy main had other ideas. In a stunning start, Green removed professional Nidamanuru, for four in the first over and Stewart then dismissed the other Lanchester opener, Patterson, cheaply to leave the visitors reeling. Despite an aggressive 34 from Brinton, wickets fell regularly as skipper Stewart continued his impressive early season form by taking 4-24. He was ably assisted by Dave Anderson and Mark Armstrong who both two wickets as Green also picked up a second. Overall, a superb bowling performance ensured Lanchester were bowled out for 98 to complete an enthralling game. Elated skipper Stewart said: “This was an unbelievable win against a top team. “It took a huge effort to get the game played and we were disappointed to be bowed out for 118 after a good start. The villagers welcome Tynedale to St John’s Green this Saturday.